By Air and Land ……the Traveling cat. One of the reasons a trip to a distant location seems exotic is that the people, plants and animals differ dramatically from the familiar stuff at home. Almost everywhere you go you will see cats, the adaptable animal companion. Cats in the past were not strangers to travel and over the past 2000 years there is evidence world-wide that the far flung travels of the traveling cat involved tagging along with people. The historical migration hypothesis maintains that cats migrated along with human traders, settlers, and conquerors and became a traveling cat. They were valuable to keep rodent populations down on ships and on land when they were settled with their human companions. However, cats weren't treated like the pampered pets of today hence having a traveling cat didn't involve the many safety precautions we have in place now. Here are some facts on travel modes and preparations. A cat’s senses are attuned to every nuance of his environment. At home, a noisy repairman or guests for dinner can put a nervous cat under the bed for days. Knowing how challenging new stimuli can be for your cat, the idea of a traveling cat on an airplane may seem impossible. Loud noises and pressure changes during flight, let alone the indignity of being stuffed into a carrying case surely are not a cat’s idea of paradise. However, due to vacations, moving because of job changes and even being involved in cat shows, thousands of cats must travel by air every year. If you have an alternative travel method other than flying it is suggested that you use it, especially if you have flat nosed breeds that are more susceptible to breathing difficulties caused by thin air at high altitudes such as Persians and Himalayans. No matter what the life event is that brings you to the boarding gate, there are ways to make the journey more pleasant for you and your traveling cat. A traveling cat is a lot like going someplace with a baby. Whether you plan an overnight visit across town or a two-month jaunty tour, there is an entire war chest of accessories and necessities that you need to take with you. Everything that your cat uses at home you will probably need to take with you: litter box, litter, scoop, bowls, brushes, medications etc. There are some ways to make life with your traveling cat less stressful for both of you: Make plane reservations for your cat at the same time you book your own. Airlines limit the number of pets that can be taken in each cabin so making plans as early as possible gives you a better chance of being able to travel alongside your cat. American Airlines allows 7 pets in a cabin while others only allow 3 or 4, so be sure to check this out. 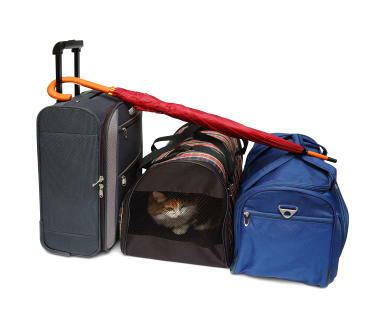 The cat carrier is counted as your carry-on bag and the fees vary with each airline. Each airline has its own pet policy so the links to the major airlines are a few paragraphs below. The carrier must fit under the seat in front of you. The airlines squeeze the seats together pretty close and consequently, under-seat storage is limited. Use a soft sided carrier if at all possible. Sometimes the hard carrier size will not fit under the seats on the plane, and then you will have no option except to stay off the flight or put your cat in cargo. I find that the middle seats are best for placing things under the seat in front of you. You may even be able to have your cat face you, making your cat feel more secure and throw one of your used shirts in the bottom of the carrier so he has the familiar scent nearby. An aisle seat is problematic in that your cat could get accidentally kicked or worse, hit by the service cart. At the airport you will be required to present a health certificate issued by a veterinarian with proof of rabies vaccination. Some airlines accept them dated 30 days prior to the flight while others only allow 10 days, so be sure to check with the airline that you will be using. Your homework should already be done for any required permits and some locations such as Hawaii require quarantine for some animals. Know the laws of entry for animals at your destination. In the event that your traveling cat is being placed in cargo, the carrier must be sturdy and properly ventilated with no sharp protrusions and large enough that the cat can stand, turn around and lie down. It must close securely with a simple mechanism. The floor should be lined with something absorbent, like newspaper or old towels, or an old shirt of yours that has your scent on it. Mark the carrier with LIVE ANIMAL labels on the top and on at least one side. Add arrows or “This End Up” to indicate the top. If your cat will need to be fed during the trip, attach a bag of dry food to the outside. Secure empty food and water dishes inside the carrier (Velcro works good) and make sure they are accessible from the outside. Also have a copy of the necessary paperwork; a copy of the cat’s health certificate, your name and address, the cat’s name, and the phone number of a contact person at the destination. One thing the airlines never alert you about is going through security. This can be the most frightening time for any pet owner traveling by air. Officers instruct you to remove your traveling cat from the carrier, place the carrier on the conveyor belt, and carry the cat through the scanner with you. Remember that alarms might be buzzing, people can be loudly dropping their keys and change into containers, along with numerous other unfamiliar noises, sights and motions. The odds are that your cat, unless he’s a global traveler, will not be accustomed to this hectic activity…and he may panic. This is a good time to have a harness on him. And I can tell you, in all the years of traveling with a cat, no one is going to offer to help you get your cat back into his carrier. Now this brings us again to the topic of tranquilizers, and unless you absolutely have to, don’t medicate your cat. 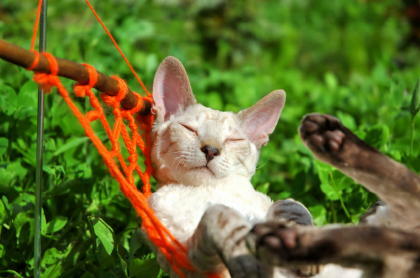 You want your cat to relax, but not be so medicated that his breathing becomes difficult in the pressurized cabin. 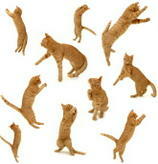 Some cats get excitable, some get lethargic, so talk to your vet about what will be best for your cat prior to leaving. Make sure his collar has your cell number taped to the back of it for a faster cat recovery if he gets away. These are just a few of the major airlines and by going to their sites you will get a good idea of what questions you have to ask if you are using an alternate airline. Also, if you aren’t just traveling but making a permanent move, there are pet movers that will do that for you. I haven't had much success with all of my cats liking car travel but a couple of them do. If you plan to make a road trip with your cats then here are a few pet friendly motel accommodations online that you can peruse. There is another website that is in it's infancy that is going to attempt to be the Travelocity type site for pets that is called Furlocity. This site has just started in the past year, and their website is now live. It's a good concept that will help make searches easier for many of us. 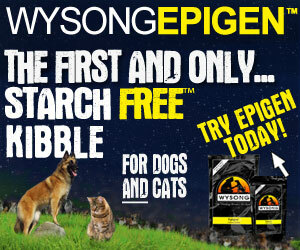 I wish them lots of success on behalf of pet owners everywhere.